Thank you all so much participating in the Macy's giveaway! Through emails, I know that some of you held dinner parties this week to raise money to fight hunger. That makes me so happy! We held our own last night in a very impromptu sort of way when my mother-in-law dropped by with a standing rib roast, all ready to be devoured. I quickly gathered the neighbors to our table. As a thank you, they made donations to the local food bank. As my way to thank them, I sent everyone with some of this Butternut and Acorn Squash Soup we have been enjoying lately. My random number generator (Bill) went to bed before midnight so I quickly emailed Jen and asked her to pick two winners. Her answer was: "48 & 119, based on time interval between kaweah's twitches in her sleep times random number." Don't you love this scientifically proven method? Ah! Congratulations to Mani and Cindy. Please send me your mailing address so I can forward them to Macy's (mytartelette[at]gmail[dot]com). Dang things are busy around here and I am liking it very much! I get to do and see, work lots of fun stuff. Indeed, if you are in the Charleston area, drop by the first annual recipe and cook-off contest which I'll be photographing for Charleston Magazine. Come support some budding cooking and baking talent! Obviously, all that buzzing about is good and getting home, plopping exhausted on the sofa makes me feel like I have contributed to the twirling world around me. I know my mom hates it because I end up calling home (France) at the oddest hours and often times while I am eating a late lunch of soup or salad while they're already in bed. Sorry. Every time I would talk to my mom last week, she'd ask me what I was eating, and my answer always was "butternut and acorn squash soup, side of petits lardons and creme fraiche". It got to the point that she started worrying immensely. "Do you need me to send you some money?" she asked one day. In her mind, if we were eating that much soup that could only mean we were ut of ka-ching. I started laughing uncontrollably. "No mom! It's our soup kick of the month and it so good I keep making it every other day!". The timid colder days did not have anything to do with it but tempting displays of seasonal squash got the best of me and I caved in. This soup could not be any simpler to make with fresh butternut and acorn squash, some chicken stock (homemade if possible), garlic and thyme. 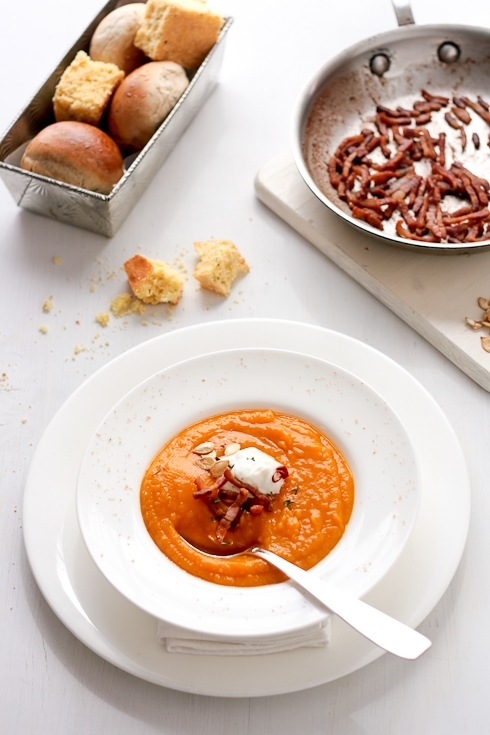 To serve, we like a little (or a big) dollop of creme fraiche and some "lardons" (thick cut bacon or salted cured pork). One day this week we added some thinly sliced dried Thai chilies and sauteed butternut squash seeds. We voted this version as the best so far but feel free to improvise! And before I forget: Please join me on Monday, October 26, when I join forces with nine of the webs best food and lifestyle bloggers for the delightfully frightful Halloween collaboration, Trick-Or-Eat. Nine haunted houses have been trimmed and tricked out on your behalf. Which of your favorite bloggers awaits behind each haunted home? Whatever have the ghostand hostesses prepared for your visit? Be sure to stop by for this ultimate Holiday Block Party, presented blog style! In a large stock pot, heat the oil over medium heat. Add the cubed squashes and sautee for 2-3 minutes or until they start to get some caramelizing color. Add the garlic and sautee one minute, stirring often to prevent it from burning (or it will become bitter). Add the chicken stock and thyme and bring to a boil. Lower the heat and cook, covered for about 30 minutes or until the squash is tender. With an immersion blender, puree the soup in the pot until smooth. If usig a food processor or blender, let the soup cool a bit before processing. Adjust the consistency to your liking with extra water. Salt and pepper to taste. Oh, I like your mom's reaction because I could see my husband's grand-mother (or my deceased grand-mothers) making the same comment... "Que de la soupe? C'est bien maigre tout cela?? (despite the lardons and the creme fraiche!!). Looks so good! I might have to pick up an acorn squash at the farmer's market on Sunday. Ha! I misread your recipe title and thought you were making soup for squirrels! Now I get that you are making a super yummy people soup. This looks rich and delicious! I love squash soups in the fall. 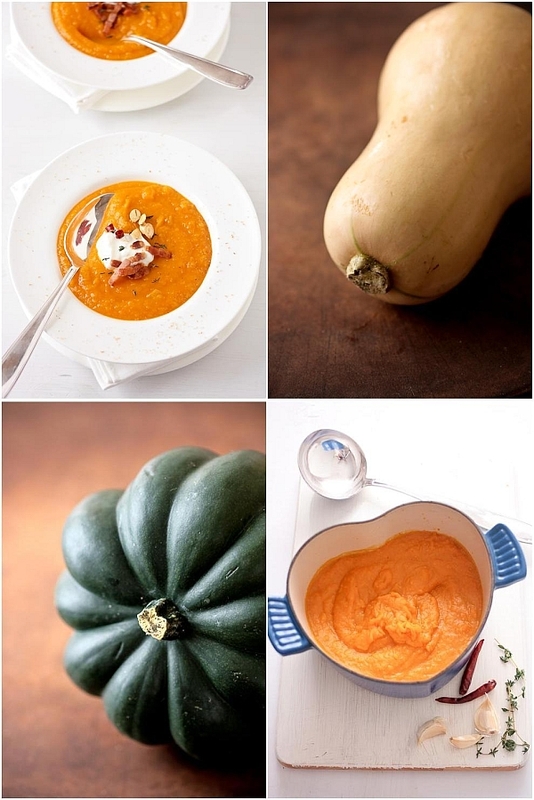 I haven't tried acorn squash as a soup before, I must give it a go. Absolutely stunning =D. I love the colour, its gorgeous. Veramente deliziosa, deve essere buonissima!! I love those perfectly-cut and fried petits lardons...it's just not (French) squash soup without them! Beautiful Helen! I love it all! The recipe, the pics...the styling! Comment bien relever une simple soupe de potiron? il ne faut pas grand chose: des lardons et de la crème comme toi, j'ai choisi une chantilly safranée et du chorizo... cela fait un vrai repas de fête avec pas grand chose. What gorgeous colors Helen! Wow... and so very very seasonal... Love it. Nice recipe and great pictures! What beautiful shots and colors! That soup must be very delicious! I'm lovein' the squash photos! Looks incredible and I LOVE that heart shaped pot! I think my mom would respond in the same way. I may have to try this, looks amazing. such a gift you have. Beautiful! J'adore les petits bols d'anthropologie. Très pratique! Je viens de fair une soupe au butternut squash le weekend dernier. I roasted them in the oven sprinkled with a little cinnamon and then cooked in stock with chili peppers and blended til smooth! I am in the mood for soup. I love soup season and this one looks fantastic. ABowlOfMush: that was a wedding present from 11 years ago. I love this little pot! Oh yum! I made some butternut squash soup too this week ! When is the cookoff? I'm going to be on kiawah this weekend for a wedding! Your photos are stunning! The soup sounds so heart and delicious. gorgeous!! I love soup- this sounds right up my street! Fantastic soup. and by golly do I love the photos. So clean, crisp. White based shots have always been my fav. - here the soup just pops against the light background and styling. brilliant as usual! I have to say I love creme fraiche in soups! I'm gonna have to try this one! Looks soooooo good! I had an acorn and a butternut squash in my hands on Wednesday. NOW I know what I can make. this is perfection. thank you! You have a very kind mom and very beautiful soup! I love that heart pot! It's so adorable:) The soup looks great too!!! Can't wait for Monday. I love all 9 bloggers. I've cooked with butternut but never made soup before for some reason. This looks good and perfect for our FINALLY fall like weather here in SC. Do you have a cookbook out? If not, you definitely should. You're one of the best cooks out there and as a baker, well, that goes without saying. this soup looks delicious, and your pohotographs are stunning. I love how it looks like the toppings give the soup a nice crunch. I just love butternut. I roasted two huge ones today and froze the puree so we can enjoy it all winter. Helen you know you are a woman after my own heart teasing with things like squash soup -- heck! savory anything -- and photos of veg, crumbs, and pans with food in them. Beeyouteeful! Phil is the squash soup pro in residence here, so I totally understand your current obsession. Good luck with your upcoming photo shoot! Wonderful post! Have you ever tried putting garlic and goat's milk into it? Fabulous. This is awesome! I have two acorn squash sitting on my kitchen counter! Your post reminds me to use them and I love soup--this is so healthy too! Looks amazing - it looks so much thicker than the squash soup I made recently. 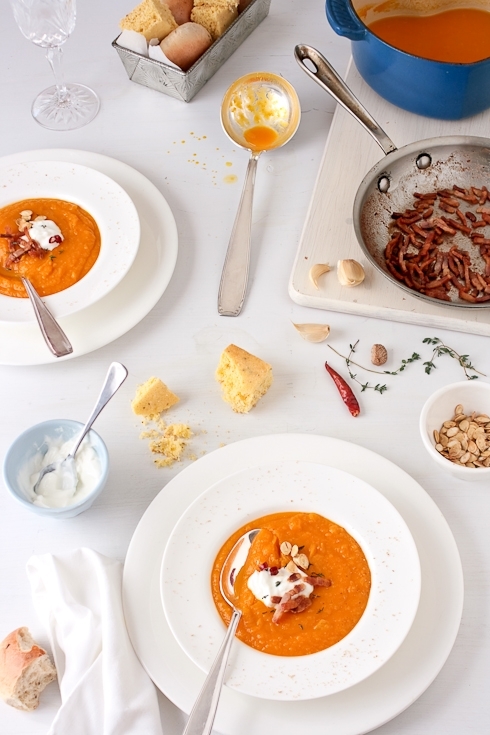 This is the perfect time of year for soup, too! Maris: you can make it as thin or as thick as you want. For lunch we tend to like on the thick side. Sticks to our rib a bit more! I am going to try this soup today. I absolutely adore your main photo. It looks so big! I love the composition and the light/airyness of it. Something to aspire to! A really lovely post; thank you. I love the heart shaped pot.